The ARM system on a chip found to be embedded in Apple's Digital AV Adapter for Lightning connector does not, according to reports, support AirPlay, but instead serves as a means of offloading hardware from the host device to ensure compatibility with all current and future standards. 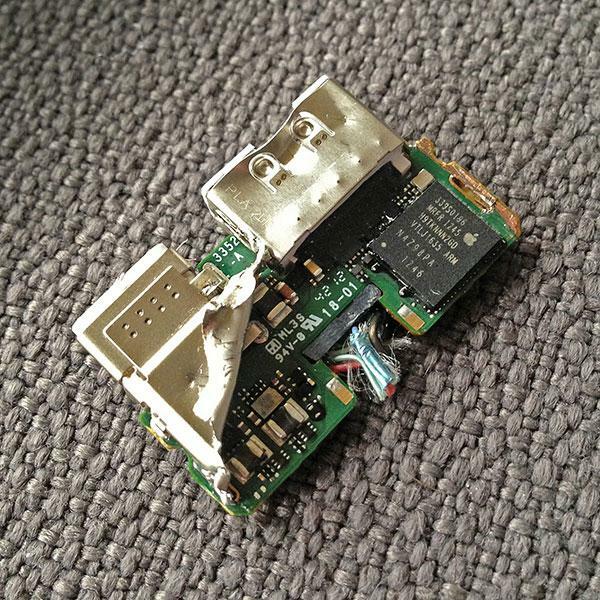 On Friday, a teardown of the adapter revealed an embedded SoC, though the exact nature of the package was unknown. Due to the presence of image artifacts and limited resolution similar to what is seen when an iOS device streams to an Apple TV, it was speculated that the adapter outputs video by converting the raw signal into Apple's AirPlay protocol before sending it through HDMI. That theory was debunked by an anonymous comment on the Panic Software blog, which provided the teardown, says AirPlay is not involved in the operation of the adapter. The accessory's SoC, the commenter says, simply "boots straight into a daemon designed to accept incoming data from the host device, decode that data stream, and output it through the A/V connectors." Interestingly, the commenter hints that they work for or with Apple in some capacity, saying "I wish I could offer more details then [sic] this but I'm posting as [Anonymous Coward] for a damned good reason." "Anonymous Coward's" take on the device's internals is very detailed, and he explains the limitations of the technology as well. For example, the Lightning protocol is simply not capable of handling raw HDMI due to the limited pinout, a concern some raised when Apple first unveiled the connector last year. In order for the I/O tech to output the necessary signal through HDMI, some sort of wire multiplexing solution would be needed as Lightning uses 8 pins to HDMI's 19 pins. Apple's Lightning is merely a serial bus, he says. The decision to use this setup was purportedly meant to streamline compatibility with a variety of connection protocols. By offloading the decoding components to the accessory, the host device doesn't need to carry support for a multitude of interfaces as it simply sends the signal to an appropriate adapter, which does the heavy lifting on the fly. This system essentially allows us to output to any device on the planet, irregardless of the endpoint bus (HDMI, DisplayPort, and any future inventions) by simply producing the relevant adapter that plugs into the Lightning port. Since the iOS device doesnt care about the hardware hanging off the other end, you dont need a new iPad or iPhone when a new A/V connector hits the market. The post ends by saying that Apple is still hard at work on developing Lightning technology. Image quality was deemed acceptable for the time being, but issues can be addressed by way of firmware updates. The commenter notes that "updates **will** be made available as a part of future iOS updates" but does not go into detail on when such an update might arrive.